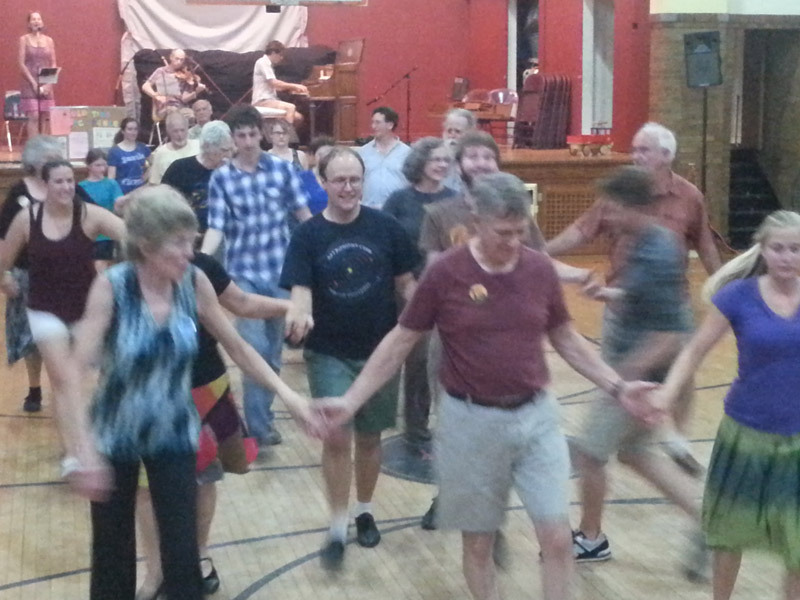 Weekly Wednesday dances start with newcomer instruction at 7:30 pm. Dancing starts promptly at 8:00 pm and the last waltz is at 10:15 or so. FREE New-comer Dance Lesson 30 minutes before the start of the dances. Most of the year, our regular dances are at Harmony School. On 1, 8, 15, & 22 August this year we will be dancing at First Presbyterian Church. The address is 221 E 6th St, but we’ll use the entrance facing the parking lot off 7th St, near Lincoln. We will return to Harmony School on 29 August (after Sugar Hill). Admission is $4 for members and $5 for non-members, unless otherwise noted. Volunteers are always welcome! Sign up with a dance coordinator for set-up or clean-up and admission is FREE! Memberships are $12/year, pro-rated by the month. Discount for students. Many of us go out for drinks and munchies after each Wednesday night dance. To find out who gets to chose where to go on a given Wednesday see The List. You are most welcome to bring your children with you to BOTMDG dances. However, please remember that you are responsible for them while they’re at the dance. We are obligated to Harmony School not to allow your children to roam the hallways and stairwells unchaperoned nor left unattended. Childcare at Harmony School can be arranged via Harmony School if requested well in advance.